It seems as if you good folks are in need of an update. As you may or may not know, we here at Blight Productions have been immersing ourselves into the exciting world of interactive narrative. Not only have we been hard at work on our ever-growing interactive documentary project, “A Fool’s Idea”, but we have also been developing a new game for story makers called, “The Viral Sockpuppets“. We are busy organizing all the footage we shot over the last two years in order to compile the first official season of “A Fool’s Idea”, and after play testing “The Viral Sockpuppets” for several weeks and putting the game on pause we have reworked some of the rules and scheduling to make this the best possible play experience for everyone. WHAT IS THE VIRAL SOCKPUPPETS? “Viral Sockpuppets” is a character-driven crowd-sourced conversational story-making game, played within the YouTube community. Every time someone asks you a question it has the potential to change the direction of your own personal narrative, but two people can only develop a narrative for a short period of time before it eventually dies. Equipping a community of storytellers with the power to design and resolve conflicts on a public stage can not only guarantee a committed audience for his or her story, but will also produce a one-of-a-kind experience. The creation of a good story does not need to be linear, formulaic or built around a single plot. 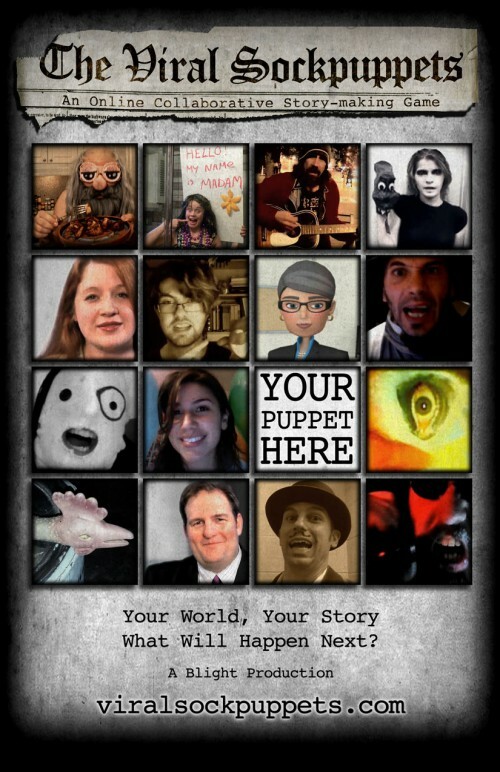 The “Viral Sockpuppets” is a virtual “story-world” populated by characters that create new organically developed stories through an “exquisite corpse”-like game. The protagonist asks the community to help resolve a dilemma by responding to the question with a “sub-plot” story suggestion. Players are then divided into categories: the active players who produce “sub-plots” and the passive players who vote on which sub-plot is selected for the narrative. Once an active player wins the public vote two times within the active narrative (it does not need to be consecutive), that player assumes the role of protagonist. At that time, the current dilemma is resolved and a new one is launched featuring the new protagonist. In this way, the “story-world” of the game never ends facilitating “sub-plots” and narrative chapters to continue the story forever. Click here for the official rules of the game. The Viral Sockpuppets interactive adventure will begin when the new dilemma is posted on July 4th, 2011. Over the summer we will be working to put together a weekly schedule of new episodic videos every week. Please be sure to sign up for the news letter and subscribe to our YouTube channel.